So, I know I told all my regular readers that I planned to try out advertising on TWC and overall I’d say I had a pretty successful run, but let me break it down for you into numbers so you have something to go by other than hearsay. To start with I did the box sponsorship deal with is only available to webcomics people and is priced to be affordable. At my time of writing this the sponsorship square was $15 for one full week of sponsorship (7 days for those counting). I ended up getting 2 weeks for $15 because I had contacted them about advertising before their rate change, which was nice of them. Before their rate change you could buy a whole month’s worth of sponsorship for $15! So This was my advertising banner for those two weeks. It is “gently” animated, lol…which is to say it just slowly switches between two of my more popular images. Overall I believe animated images are going to stand out better than static ones because any movement in the corner of the screen always attracts the eye. That being said I’m not entirely sure mine is “animated enough.” Overall just make sure your image is eye catching and easily readable. There is always the off chance someone will remember the title and google search it later. I mean stranger things have happened right? XD Anyway enough about this though, let’s move on to the numbers. The above image shows my analytics report for just TWC for only the two weeks I advertised with them. Also keep in mind I am a small site, so what looks good to me in numbers may be less so for larger sites with a larger following. Ok, let’s start with the sessions. 1,224 people actually visited my site during that time, and yes some of them were bounces, but still I got 1,224 clicks. If you divide that into $15.00 you wind up with roughly $.01-.02 CPC, which is awesome and wonderful and great. XD However with their new pricing scheme of only one week for $15 means the cost break down will be different. So for simplicity’s sake let’s cut that number in half to 612 clicks (even though it’s not super precise or scientific) and divide that into $15 and we wind up with roughly $.02-.03 CPC, which is still really good and what you can conceivably get through PW ads if you target well and babysit your advertisements. 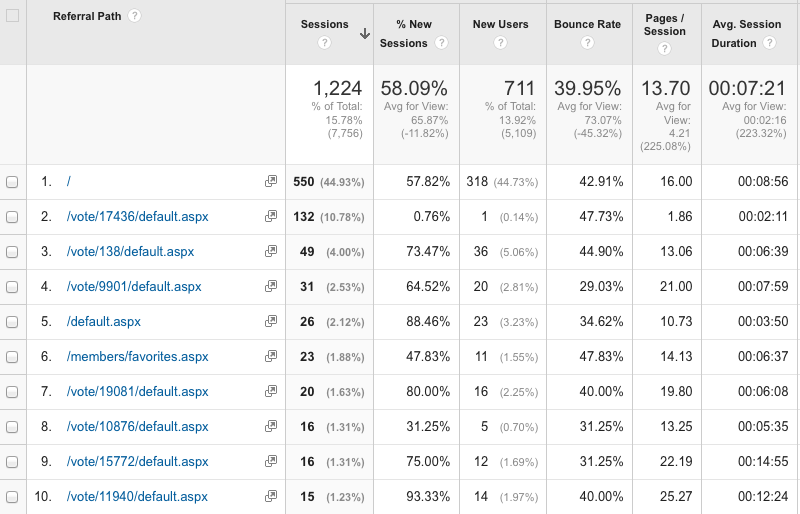 The next factor we need to look at is “new sessions” which as title would indicate is how many of those visits were from people who are newly visiting your site (in estimation). In this case it was 58% which is fair. It must also be considered that since I have had a listing on TWC for over a year now which factors into this score. You can get a higher percentage of new visits when advertising for the first time on sites. For example when I first advertised on smackjeeves, 80% or more were new sessions, but if I were to do advertise again today my new sessions percentage would probably be closer to 50%. This being said, it brings me to my tip. You can bleed your advertising well dry by advertising too often or too long on any one site, so you need to mix it up. The next important statistic is your bounce rate. A bounce rate tells you how many people clicked your link and then promptly left. 39% is what I consider a good bounce rate and is evidenced by the pages statistic that on average people read almost 14 pages of my archive. It is possible to get an even lower bounce rate, like 28% or so, but anything considerably lower indicates you have a problem with your analytics script and you need to troubleshoot it. So all in all when advertising on TWC, since it’s very targeted marketing, you are getting a good bounce rate. Only 39% of 1,224 bounced which if we do the math means around 767 people were engaged enough to stay and read more than one page. A couple more things that should be considered when advertising on TWC is the time of month and voting. My time slot was at the end of the month and during that time and FSR’s readers were encouraged to vote to help FSR get higher on the list. You will notice looking at the graph that as voting picked up and FSR when higher on the list that we saw a slight uptick in the number of visits. So, to get the most our of your advertising, encourage people to vote! I would suggest even start a voting campaign a week before you start advertising. So that about does it for my numbers crunching on TWC advertising. TWC isn’t going to give you a huge burst of traffic, but rather a slow burn over time that I found to be worthwhile and I will probably try it again in another month or so after things have had time to settle. The only thing I don’t have statistics on is how many people will potentially be returning customers so to speak and I probably won’t be able to reliably tell since I’ve had a few referral spikes since then from doing guest art and a tumblr post blowing up. I do want to leave you with some links to some other really great comics advertising statistics that can help you with your research. I know it’s been a couple of months, but I wanted to thank you for putting this together. I’ve been considering advertising on TWC at some point but have been putting off making animated ads. No problem, hopefully you found it helpful. 🙂 As for making animated ads, I don’t feel it’s super necessary as long as you have some eye catching art, and even just doing a simple image rotation can be enough.